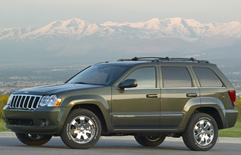 The Jeep Grand Cherokee returns for 2009 as solid an SUV as Jeep owners have grown accustomed to. With its aggressive stance, signature Jeep grill, circular headlights and bodyside moldings the Grand Cherokee exudes the perfect balance between athleticism and class. There are four 2009 Jeep Grand Cherokee models available to choose from - the Laredo, Limited, Overland and the Rocky Mountain. The roomy interior of the Grand Cherokee features comfortable ergonomically friendly seating available in various levels of trim depending on the model. With the rear seats folded the Grand Cherokee supplies 66.8 cubic feet of cargo area. Jeeps most luxurious model of Grand Cherokee - the Overland offers many premium features such as real wood interior accents, Monotone Royale leather heated seats with accent piping, navigation system and SIRIUS Satellite Radio. The Grand Cherokee sports an upright and substantial posture designed to protect the sides from potential road debris. For off-road enthusiasts the front fascia is two piece allowing the entire lower piece to be removed before hitting the trails. There are four engines available for the Grand Cherokee. A 2.0 Liter Common Rail Turbodiesel which produces 215 hp is optional on the Laredo, Limited and Overland models. Standard on the Laredo is a 3.7L SOHC V6 with 210hp. A 4.7 Liter SOHC V8 305hp engine is standard on the Limited and available on the Laredo. The 5.7 Liter HEMI® V8 that cranks out 357hp is standard on the Overland models and available for the 4x4 Limited models. There is a choice of three 4x4 systems for the Grand Cherokee - Quadri-Trac I®, Quadri-Trac II® and Quadri-Drive II®. All four wheel drive systems are Trail Rated®. The safety feature list of the Grand Cherokee is a long one that includes features such as Electronic Stability Program (ESP), Electronic Roll Mitigation (ERM) which help maintain vehicle stability in various road surface and weather conditions. Hill Descent Control, Hill Start Assist and Trailer Sway Control. Side-curtain air bags with roll detection system. Tire Pressure Monitoring System with Warning Indicator. And the list continues. Get a Free Price Quote on a Jeep Grand Cherokee.